1 Only the Lonely. Infected while working in another hospital, nurse Zhang looks out the window of the isolation ward of You'an Hospital in Beijing. 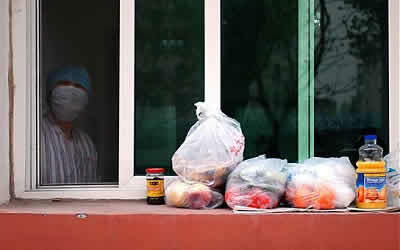 The food on her windowsill were placed there by relatives who were prevented from bringing anything into her room. We would like to thank freelance photographer Lou Linwei who covered the story on SARS for TIME Magazine in Beijing, for permission to use these pictures. The above pictures can also be found at the website of TIME Magazine.